Customs officers seized almost HK$2 million (US$255,000) worth of suspected cocaine at Hong Kong International Airport from a 31-year-old man arriving from Ethiopia, who allegedly stowed the drug in a hidden compartment of his hand luggage. The man, who faces a maximum fine of HK$5 million and potential life imprisonment under the city’s drug laws, was arrested yesterday after officers discovered about 1.95 kilograms of the substance in his bag. 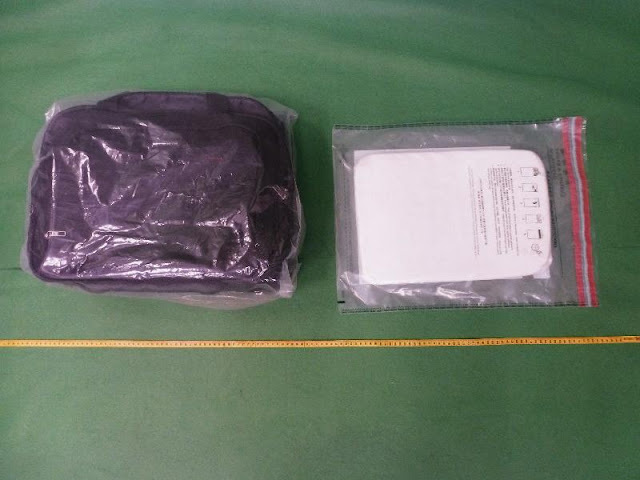 In a statement, Hong Kong Customs said the suspect, who arrived from the Ethiopian capital Addis Ababa on an afternoon flight, had a slab of suspected cocaine hidden in a false compartment in his carry-on bag. According to customs department figures, officers handled 762 dangerous drug cases last year, which led to 328 arrests and the seizure of narcotics valued at some HK$432 million (about US$55 million).